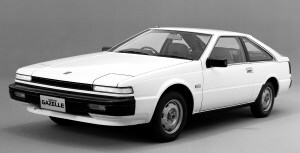 Nissan Gazelle (S12). 1983–6 (prod. n/a). 2- and 3-door coupé. F/R, 1809 cm³ (I4 OHC), 1809, 1990 cm³ (I4 DOHC). Silvia twin, with the same changes applying. Keyless entry and tilt-up electric glass sunroof were notable, novel features. Distinguished mainly by taillights and grille. Range deleted at the time of the mid-term refresh for Silvia.